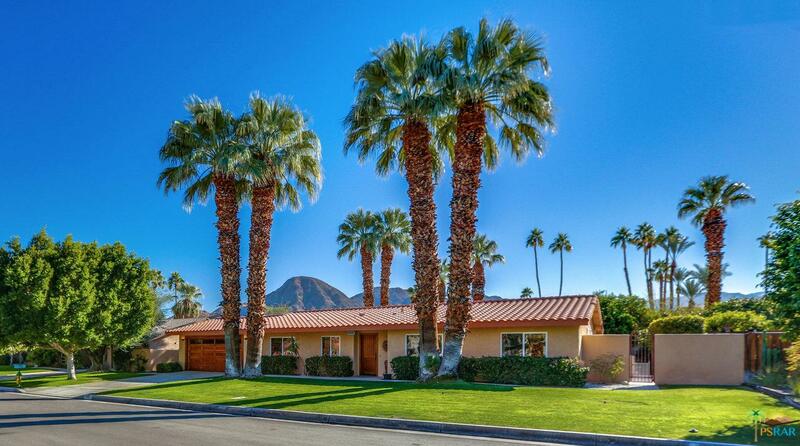 Tucked away on a quiet street and over-sized lot in South Palm Desert, close to all conveniences and minutes away from El Paseo with its restaurants, shops and entertainment, this charming ranch style home with a Santa Fe flair will certainly tug at your heart. The open floor plan layout features a vaulted ceiling living room, breakfast bar kitchen, a generous master suite with a large walk-in closet and two guest suites with one additional bath. Enjoy the cozy fire place, Saltillo tile flooring throughout, updated windows, new water heater, fresh interior paint, refinished solid wood front & garage door. Outdoors await a sparkling pool/spa, a large covered patio area, with misting system, perfect to entertain friends and family, a mature landscaped yard with multiple citrus trees framing beautiful mountain vistas and offering great privacy. For an easy move in, this property comes turnkey furnished so bring your tooth brush and start enjoying the desert lifestyle!